Don't animals teach us about blessing, about joy? They remind us to be satisfied with what we have. Not one of them is worried about the stock market. Not one of them wants to run for Congress or govern the animal kingdom. None brags that their religion is better than their neighbor's. Each is satisfied with just a little: fresh water, healthy food, and enough room to nest or den. None needs a passport or travel documents or immigration papers, because they don't live in a state like Arizona or Texas that cares about such things. They live in a state of bliss. Do you have a special bond with your pet? Does your child or grandchild delight in the presence and company of your dog, your cat, your horse, your Iguana? As you come home from work or play: is your pet there to greet you (sometimes with a wagging tail or a sloppy kiss)? 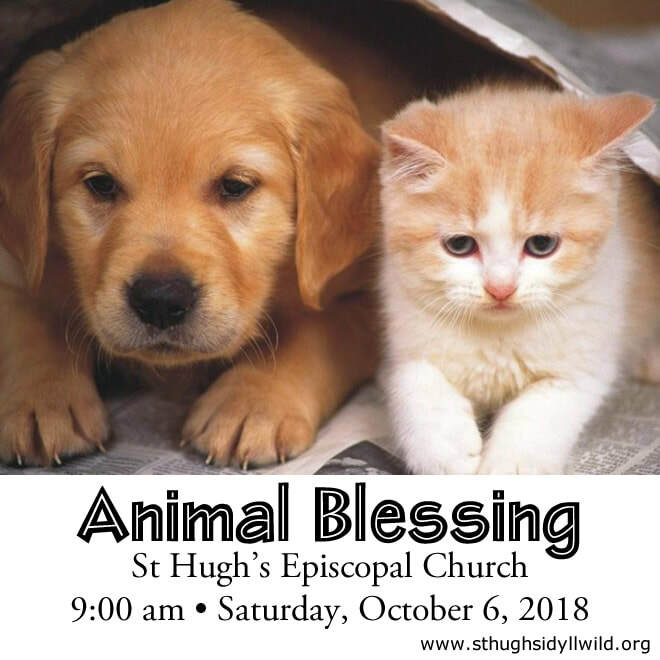 Then, come celebrate their presence in your life in a Blessing of the Animals at St. Hugh’s Episcopal Church on Saturday, October 6, 2018 at 9:00am. We’ll gather outdoors on our Labyrinth. After a short meditation and prayer we'll bless the animals you bring to our celebration. ​Please provide for the safety of your animals (dogs on leashes, cats and smaller pets in carriers, birds in cages and so on). All pets are welcome. Even a Teddy Bear or other stuffed animal that “speaks” of a mutual love among creatures will be blessed for those children who want to present their special friend for a blessing. Pictures of beloved pets who don’t travel well are also welcome. It’s a celebration of the diversity of life and the lessons of love learned from our animal companions. All are welcome, you (and your animal companion) are invited. Come. Bring your animal companion.